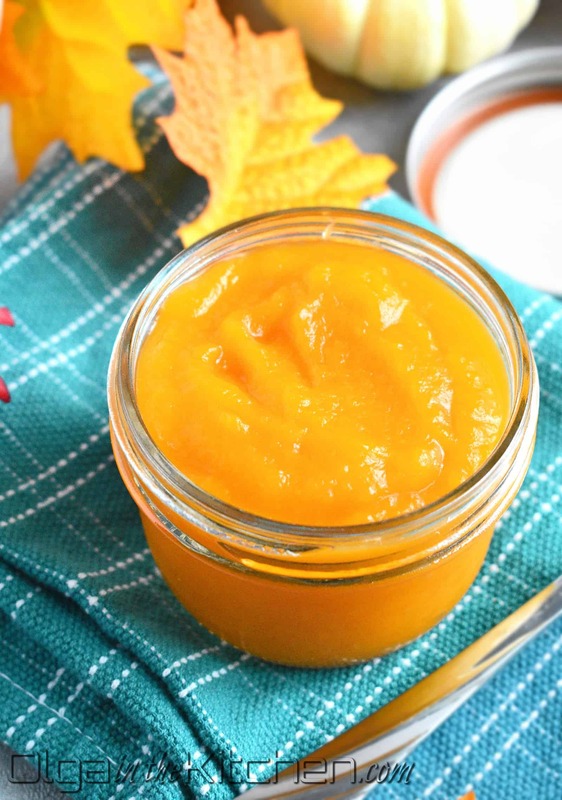 Homemade Pumpkin Puree: simple and easy way to have light in texture and fresh pumpkin puree. 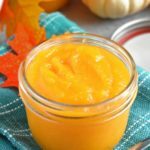 Homemade pumpkin puree can be used in many different desserts and meals and the taste is delightful! Don’t be scared of making your own homemade pumpkin puree; it’s extremely easy, just takes a little time to cook and cool. In the past I never cared for homemade pumpkin puree until few weeks ago when I tried making mom’s popular Ukrainian pumpkin bread that we all absolutely love and always asking mom to make for us. The bread didn’t turn out. 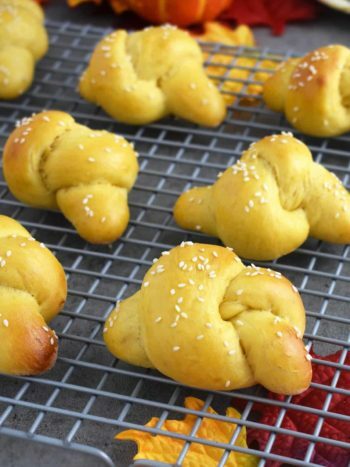 Strange, right?I used store-bought canned pumpkin and it ruined the bread. I even tried different brands. The bread is suppose to be fluffy, light in color, round and giant and with the canned pumpkin, it was everything opposite. Mom warned me that it will not work out and it won’t be the same as her bread and she was 100% right. Next day, I had my mom show me how to make my own pumpkin puree her way AND make the delicious bread as well. As soon as the bread was out of the oven, half of it was gone because my two kiddos ate it. The bread is huge in size, like the Easter bread Ukrainians make – round and giant! That is why I decided to make my own homemade puree. 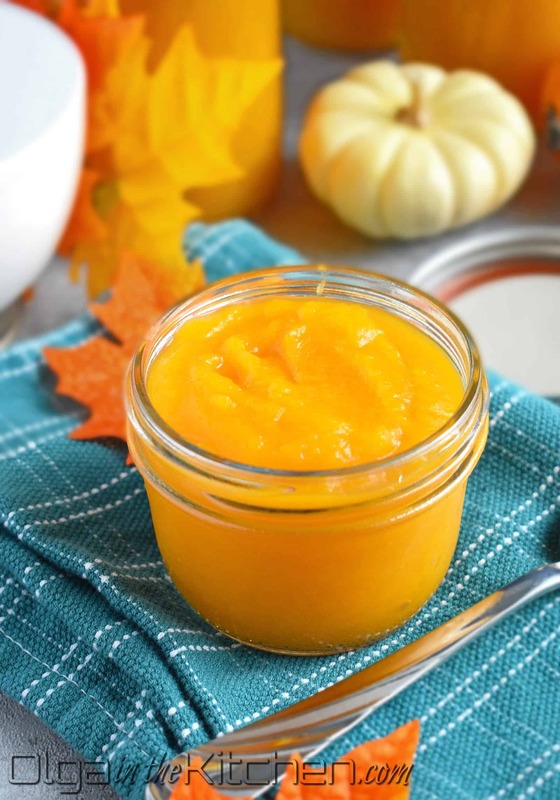 The texture of homemade pumpkin puree is so light and fluffy, reminds me of baby food, especially the applesauce and the color of puree is actually very light orange, but also depends on the pumpkin – it can be almost yellow. Every fall, usually beginning of November because that’s when you can get really cheap or even free pumpkins at local farms, my mom makes the puree and cans the puree into glass jars so she can make the pumpkin bread in winter. Refrigerate the jars in fridge up to couple months. If you want to have the homemade pumpkin puree for the long run, freeze the puree – one cup in a Ziploc bag. The homemade pumpkin puree is more watery than the puree you buy from store, but it works great in recipes calling for homemade puree, even if there’s a bit extra water after thawing the puree. Depends on the size of your pumpkin, my pumpkin in here was about 14” diameter and I needed 13 pint Ball jars. I love using wide mouth jars because it’s much easier to can, then eat and then wash the jars. I also love that these are smaller and you go through the jar fast, rather than having huge open jar standing in the fridge, waiting to be completely used. As soon as one little jar is empty, we reach for the next. 1. Wash the pumpkin with warm water and use sponge if needed to get any dirt off (you don’t want the dirt accidently getting into puree). 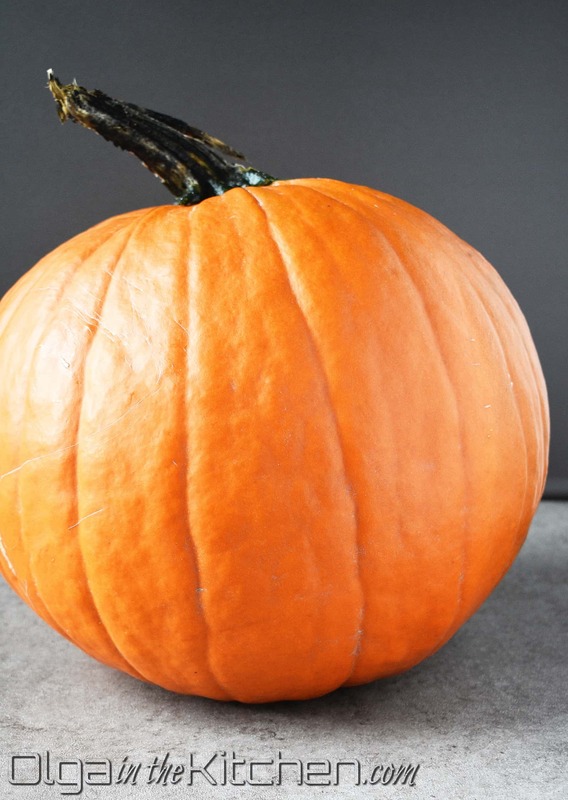 Using a sharp knife, cut the pumpkin in half and remove the seeds and scrape out the pumpkin pulp. 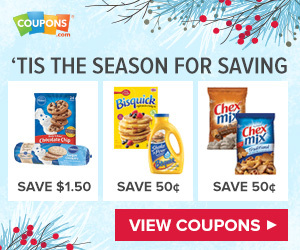 (Keep the seeds refrigerated until you’re ready to toast them!) Cut the pumpkin into any smaller sizes, cubes or rectangles, peel with a thin knife, cut into 2” cubes and add to a large pot. (You might need couple pots.) Add cold, warm or hot water (cold will take longer to get to a boil) about 2” below pumpkin cubes – it doesn’t have to cover all the pumpkin. Bring the pot to a boil over high heat, lower the heat to low and cook for 1 hour or until you can easily pierce the pumpkin cubes with a fork. 2. While pumpkin is cooking, preheat the oven to a 215°F. Wash jars and lids with a warm soapy water. Place the jars into the oven on the center rack upside down and dry them for 20 mins or until completely dry (20 mins always works for me). Remove hot jars with pot holders onto kitchen towel – keep them upside down to prevent any lint from getting inside the jars. Boil lids in a medium pot for 4-5 mins. Drain the water and transfer hot lids to a kitchen towel to dry while pumpkin is cooking. 3. Once pumpkin is cooked, drain most water (water will keep running little by little, but drain the huge flow) and set the pumpkin to cool a bit so you don’t blunt the blender knives. Once cooled, using a blender or a food processor, puree the cooked pumpkin in batches until applesauce consistency (1-2 mins in blender worked great). Remove any remaining water from the pot and pour the pureed pumpkin back into the pot. Do it fast to avoid major splashing. Bring the pumpkin puree to a boil over low heat (#4 on my cooktop) and cook for another 10-15 mins. (Puree will start boiling almost right away, but the way to know when it’s really boiling is when the puree has huge bubbles, the top of the lid is all splashed up and the pot is really hot). 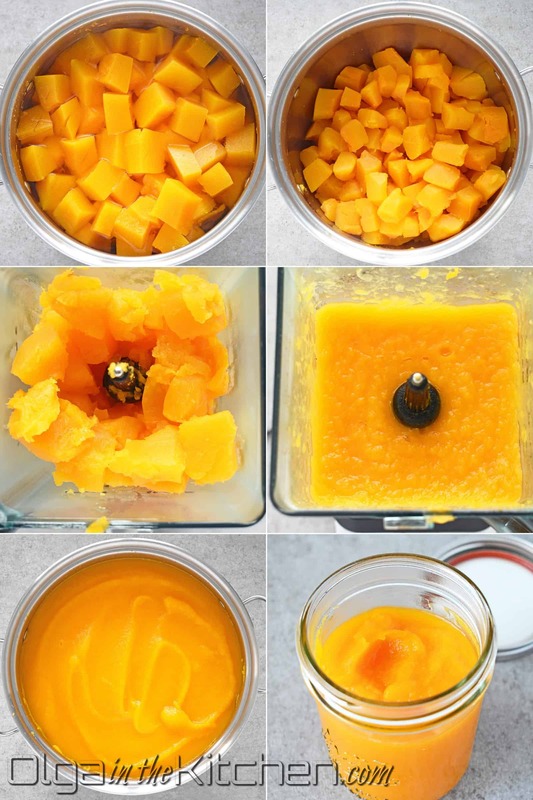 Spoon pumpkin puree into jars. Wipe the rim with a paper towel to make sure it’s free of any puree and tightly close each jar right away (but not too tight that the jar can’t handle). Pumpkin puree can be used right away. Refrigerate or freeze any unused puree once cooled. 4. Cover jars with couple kitchen towels until completely cooled – it might take a day. Once cooled, keep these in fridge. Enjoy and let’s bake more pumpkin goodies after holidays!! 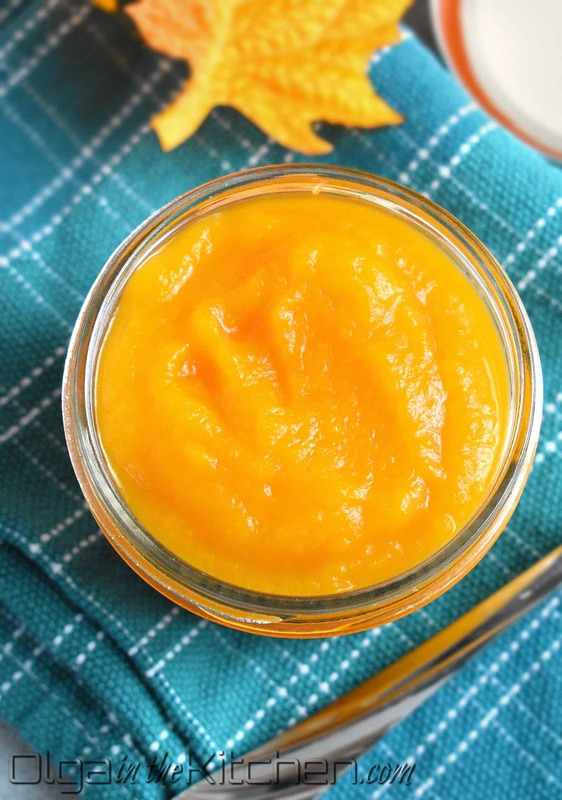 Homemade Pumpkin Puree: simple and easy way to have light in texture and fresh pumpkin puree. Wash the pumpkin with warm water and use sponge if needed to get any dirt off (you don’t want the dirt accidently getting into puree). 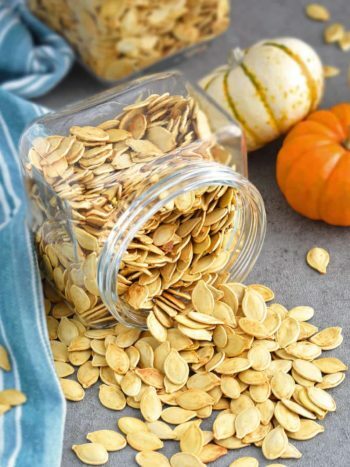 Using a sharp knife, cut the pumpkin in half and remove the seeds and scrape out the pumpkin pulp. (Keep the seeds refrigerated until you’re ready to toast them!) 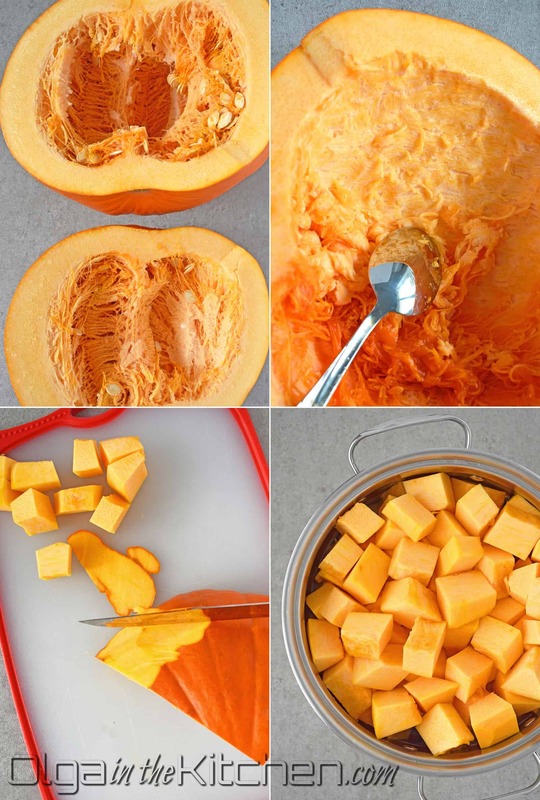 Cut the pumpkin into any smaller sizes, cubes or rectangles, peel with a thin knife, cut into 2” cubes and add to a large pot. (You might need couple pots.) Add cold, warm or hot water (cold will take longer to get to a boil) about 2” below pumpkin cubes – it doesn’t have to cover all the pumpkin. Bring the pot to a boil over high heat, lower the heat to low and cook for 1 hour or until you can easily pierce the pumpkin cubes with a fork. 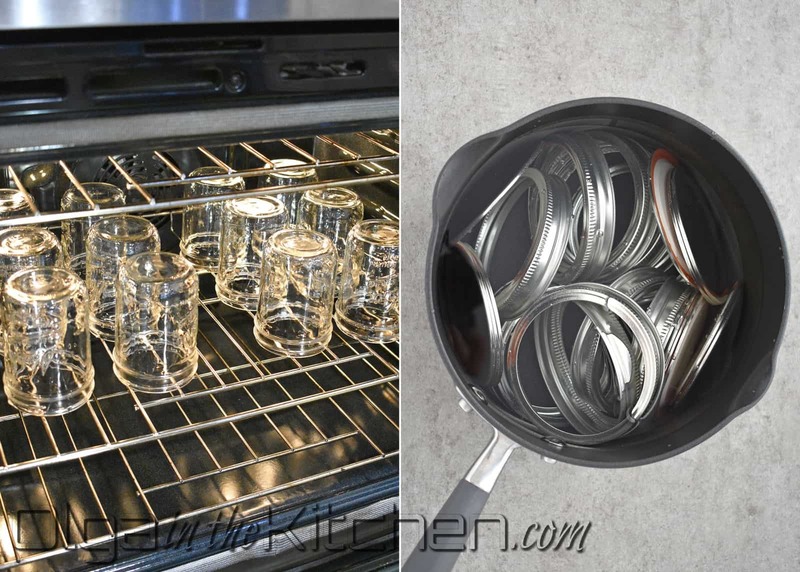 STERILIZING JARS and LIDS: While pumpkin is cooking, preheat the oven to a 215°F. Wash jars and lids with a warm soapy water. Place the jars into the oven on the center rack upside down and dry them for 20 mins or until completely dry (20 mins always works for me). Remove hot jars with pot holders onto kitchen towel – keep them upside down to prevent any lint from getting inside the jars. Boil lids in a medium pot for 4-5 mins. Drain the water and transfer hot lids to a kitchen towel to dry while pumpkin is cooking. Once pumpkin is cooked, drain most water (water will keep running little by little, but drain the huge flow) and set the pumpkin to cool a bit so you don’t blunt the blender knives. Once cooled, using a blender or a food processor, puree the cooked pumpkin in batches until applesauce consistency (1-2 mins in blender worked great). Remove any remaining water from the pot and pour the pureed pumpkin back into the pot. Do it fast to avoid major splashing. Bring the pumpkin puree to a boil over low heat (#4 on my cooktop) and cook for another 10-15 mins. (Puree will start boiling almost right away, but the way to know when it’s really boiling is when the puree has huge bubbles, the top of the lid is all splashed up and the pot is really hot). 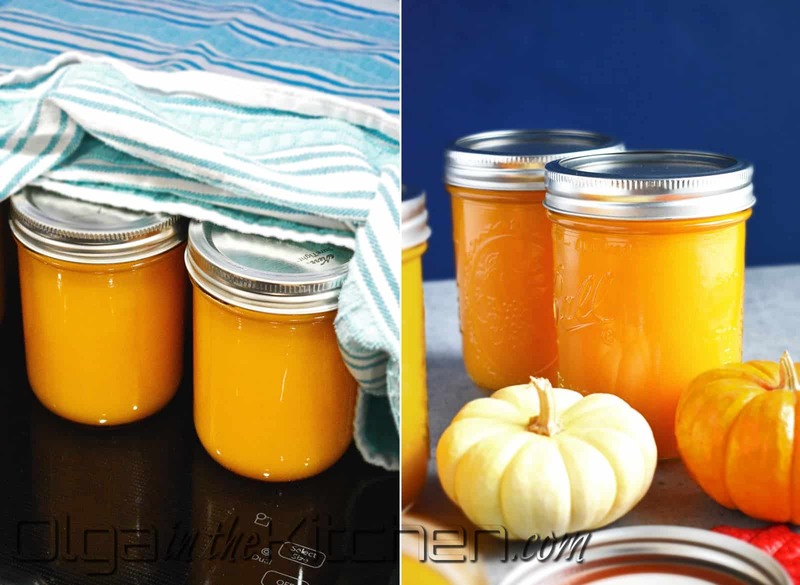 Spoon pumpkin puree into jars. 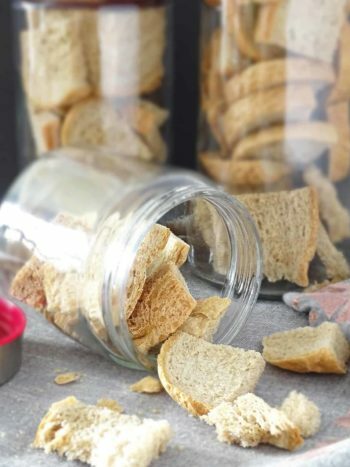 Wipe the rim with a paper towel to make sure it’s free of any puree and tightly close each jar right away (but not too tight that the jar can’t handle). Pumpkin puree can be used right away. Refrigerate or freeze any unused puree once cooled. Cover jars with couple kitchen towels until completely cooled – it might take a day. Once cooled, keep these in fridge. 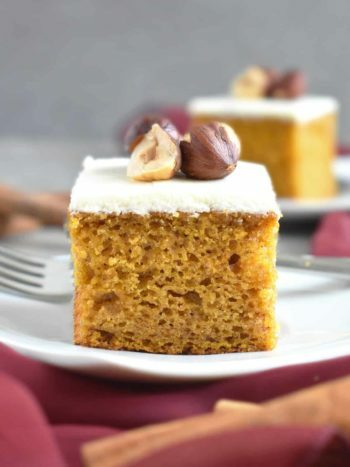 Enjoy and let’s bake pumpkin goodies together once summer is back!! Such an easy recipe to follow. I did just like you said. I kept three jars in fridge to last me until Christmas and the remaining puree I froze in bags. Can’t wait for the Ukrainian pumpkin bread!! We came across your recipe last night, and decided to try today. 6 large pumpkins later, we canned almost half and froze remaining. We have a huge family and everyone loves pumpkin, all the kids. We saw your insta story for the pumpkin bread and cannot wait for you to post it. Our kids would love it. I’m eager to try it myself lol Thank you for making our cooking so easy. Aww nice, I’d rather have my kids eat pumpkin bread than candies 🙂 I’m not sure when, but I will try my best to post the bread soon.